I was recently asked if I would like to try the Snugglebundl, so you may think what on earth is a Snugglebundl? (see photo below) Snugglebundl has multi uses the way I would describe it is that it's a pouch to lift your baby around in but it's not any old pouch. 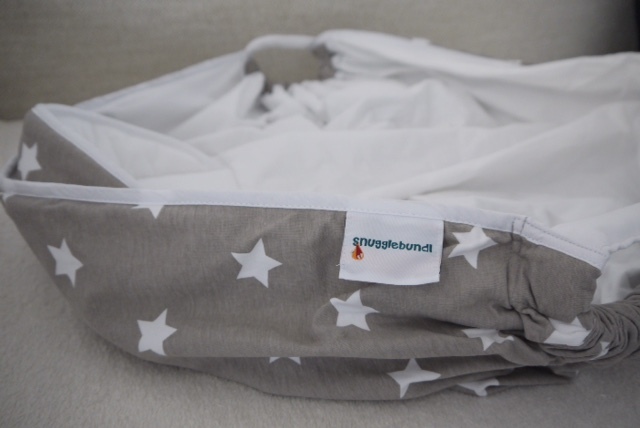 The pouch gives you the hassle free travel to enable you to move your baby between car seat, crib and pram so you won't wake them. 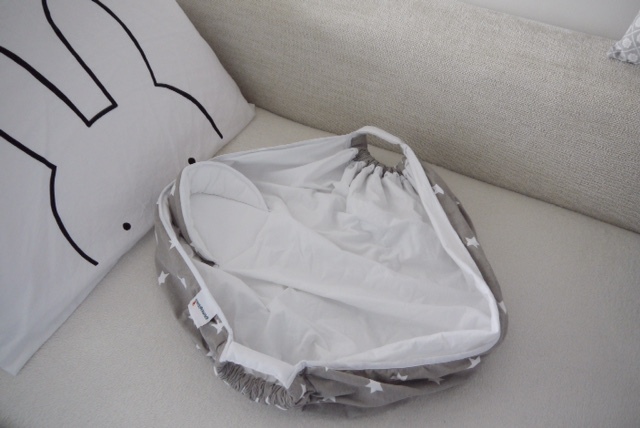 The snugglebundl is specially designed so that your baby's body, head and neck are safely supported. 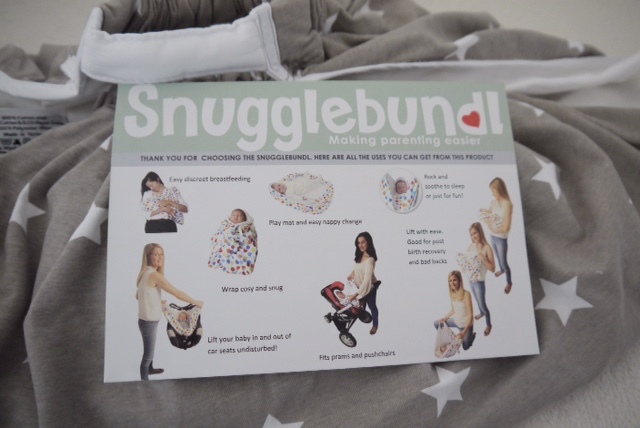 The Snugglebundl can be a great help in getting your baby to sleep and most importantly in keeping them asleep as you move around. It's easy to lift and lay without straining your back or tummy muscles so perfect if you have just had a C section. Most importantly is it gives you more "you / rest" time if the baby is sleeping more. 4. Lifting baby in and out of car seat undisturbed - I have seen people just leave the car seat in the car so you no longer have to carry that heavy thing in and out of your home. 5. It can also be used in your pram / pushchair. 6. Rock to soothe to sleep - always a good one. 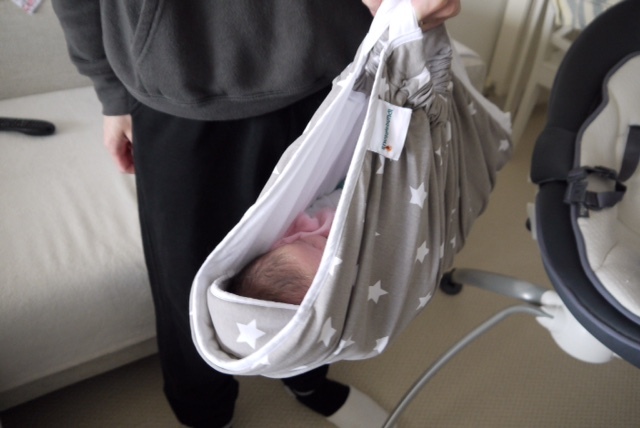 We like to use ours at home more and using it as a lift from the lounge into the cot. 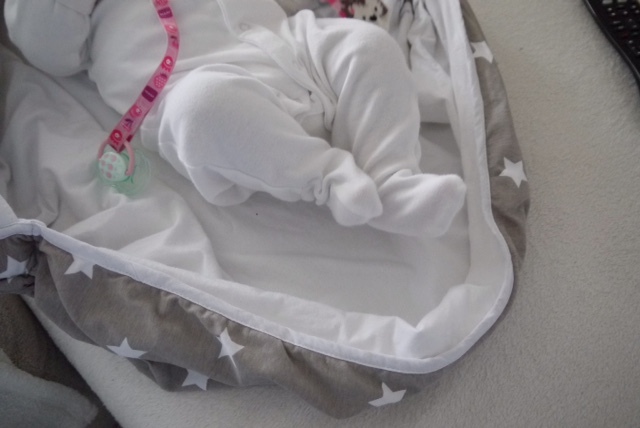 Usually during the weekday I would lay her on the Snugglebundl on the sofa and when she's asleep I would lift her up and take her into the bedroom to put her into the cot like the photo above. Soon as she's in her cot I can get on with doing chores around the house. I have noticed she does like being carried around, it must be the swinging movement that's soothing for her. I am sure if you have a baby that cries constantly just lifting them up around like this it will instantly soothe them and possibly stop the crying. 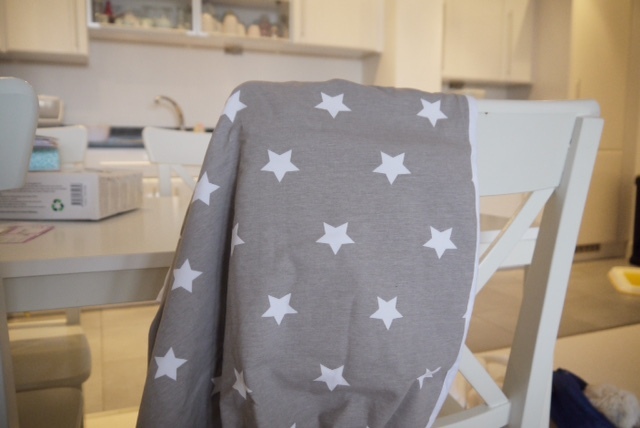 The material is very soft and there is a slight padding on the head bit for that extra support. We absolutely love using it, this is such a simple product yet so effective. If you are expecting or know someone who is expecting this would make a great present as it can be used from day 1. Mums are willing to try anything for that extra 10-15 minutes sleep! 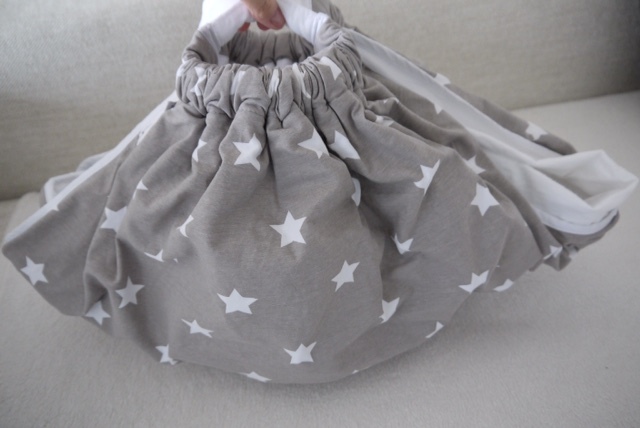 We absolutely love our Snugglebundl and I would highly recommend it to all mummys! The Snugglebundl comes in various designs. If you are still trying to decide if you should buy or not then read the FAQ.